MANILA -- Chief Presidential Legal Counsel Salvador Panelo on Wednesday defended President Rodrigo Duterte’s decision to declare void ab initio (from the beginning) the amnesty granted to Senator Antonio Trillanes IV, arguing that it is "constitutionally allowed." Panelo said Trillanes did not only meet the requirements of the law but also abused the grant of amnesty after failing to comply with its terms and conditions. “Alam mo iyang amnesty is akin or similar to conditional pardon. Kapag binigyan ka ng conditional pardon, kailangan mag-comply ka sa terms and conditions ng pardon. Kapag hindi ka nag-comply diyan, iuurong yan (Your amnesty is akin to conditional pardon. If you were given conditional pardon, you need to comply with the terms and conditions. 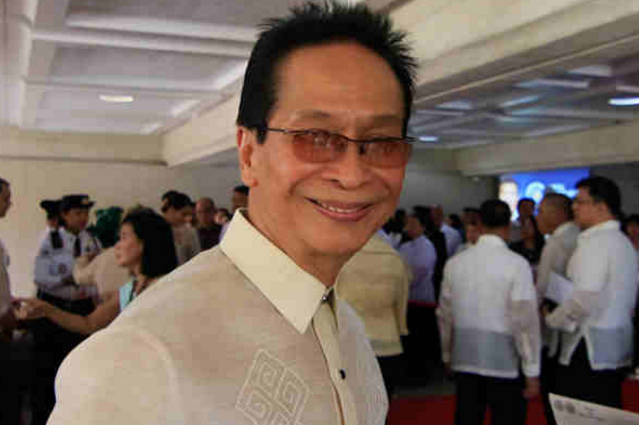 If you do not comply, it will be cancelled),” Panelo explained in an interview over dwFM. On August 31, Duterte signed Proclamation No. 572, declaring void ab initio the amnesty granted to Trillanes by Duterte’s predecessor, former President Benigno Aquino III, in 2010. Duterte based his declaration on Trillanes’ failure to submit application for amnesty to the Department of National Defense and to expressly admit his guilt for the crimes he committed during the Oakwood Mutiny in 2003 and the Manila Peninsula siege in 2007. Panelo said Trillanes, a staunch critic of Duterte, has effectively committed what he did against the administration of former President Gloria Macapagal Arroyo when he started bombarding Duterte with accusations he cannot prove. “Ano ba ginagawa niya? Naghahasik siya ng lagim, nagtatanim siya ng galit a poot at parang – hindi lang parang eh - nag-i-incite siya na mag-uprise ng tao laban sa gobyernong ito at kay President Duterte (What did he do? He's sowing terror, anger, and he's inciting the public to rise against the government and President Duterte),” Panelo said. He said the government, acting through the President, has the inherent right to protect itself from assault coming from any individual. “As Chief Executive and Head of Government, he has the power to issue orders protective of the State and its people. This is in line with the prime duty of the government to serve and protect the people under Article II, Section 4 of the 1987 Constitution,” he said in a statement on Sept. 4. “The State cannot be shackled by an act of clemency it has given to a political offender when the latter pursues subsequent acts inimical to its interest and violative of its fundamental charter,” he added. “While the Senate and the House of Representatives concurred with Proclamation No. 75, both houses recommended that no application for amnesty shall be given due course without the applicant admitting his guilt or criminal culpability of any or all of the subject incidents in writing as expressed in his application,” he said. Consistent with such recommendation, he said, the DND Ad Hoc Amnesty Committee crafted an implementing rule which basically states that no application shall be approved without an express admission by the applicant of actual involvement or participation in connection with, in relation or incident to the Oakwood Mutiny, the Marines Stand-Off and/or the Peninsula Manila Hotel Incident as indicated in the application form. Panelo also said the amnesty can be declared null even without the concurrence of Congress. “Senator Trillanes has abused a grant of amnesty, albeit void, and it compels its nullification by the President – official authority who is considered by the 1987 Constitution as the grantor of executive clemencies,” Panelo added. Meanwhile, Panelo said the government will respect the decision of a Makati court to set a hearing on September 13 for an application for an alias warrant of arrest against Senator Antonio Trillanes IV. “Well, kung yan ang sinabi ng hukuman, (eh) di susundin natin (if that’s what the court said, then we will follow),” Panelo said in an interview with CNN Philippines. Makati Regional Trial Court Branch 148 president judge Andres Bartolome on Wednesday gave Trillanes five days to comment despite state prosecutors’ plea for “Very Urgent Ex-Parte Omnibus Motion for the Issuance of Hold Departure Order and Alias Warrant” versus Trillanes. Panelo said there is no need for the government to persuade the Makati RTC to immediately issue an arrest warrant against Trillanes. “Alam po ninyo ang Malacañang ay palagi sumusunod sa pamamaraan ng batas. So kung ano ang sinabi ng hukuman na may hawak ng kaso ay susundin natin (You know Malacañang always abides by legal processes. So whatever the court says, we will follow),” Panelo said. The prosecutors of the Department of Justice (DOJ) have applied for an issuance of an alias warrant in line with Duterte’s directive for the military and the police to arrest Trillanes. Panelo said the burden of proof is now at Trillanes’ hands whether he indeed has an approved application for amnesty and if he really admitted the crimes of rebellion. “If he has (an) application but was not submitted in the office, then there is really no record. Therefore, he did not apply,” Panelo explained. Panelo said he initiated the review of Trillanes’ amnesty based on some complaints that the former Navy officer has no application for amnesty.